We’ve Got Space & Speakers-All We Need is You! Many of the world’s top professionals and influencer brands in travel media will gather again for two full days of breakout sessions, parties, networking and creative brainstorming at TBEX North America 2017. 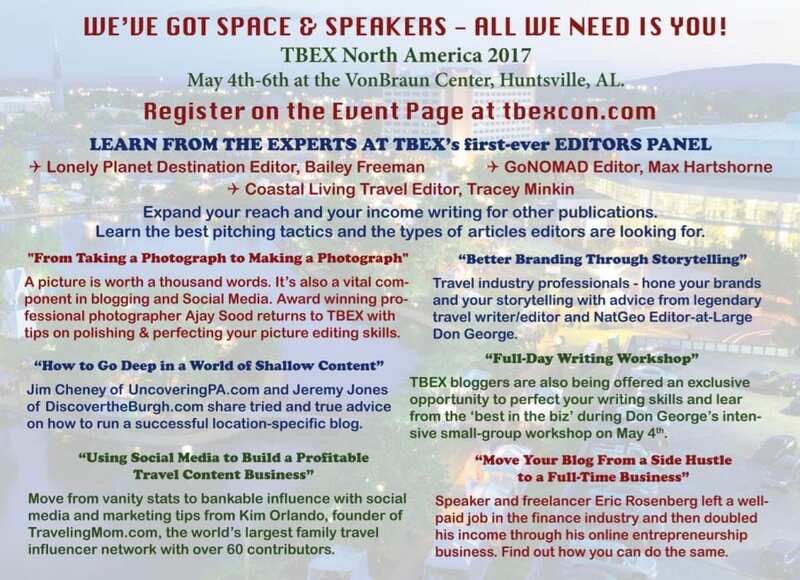 And if you’re a travel blogger, photographer, social media marketer or travel industry professional, Huntsville’s VonBraun Center is THE place to be May 4th-6th, 2017. Here’s a glimpse of what we have in store … from TBEX’s first-ever Editors Panel to exclusive small-group Writing and Photography Workshops to full days of Breakout Sessions covering the latest and hottest in the travel media biz, there’s something for everyone in Huntsville. And by the way … our keynote speakers are gonna ROCK the Rocket City! Bruce PoonTip of G Adventures and TV host/world traveler Samantha Brown have BIG ideas and even BIGGER things happening behind the TBEX scene in Huntsville. Will you be a member of the world’s largest blogger conference, or will you just watch it from the social media sidelines? Register NOW for TBEX North America 2017 and prepare to ROCK the Rocket City with us! Please remember to use the hashtags #ihearthsv and #tbex while posting your experiences and stories during TBEX North America 2017!